When I first moved to the States my adorable husband and I didn't decorate for Christmas, the first year we were together we traveled home to England and visited with family and friends... actually we had a blessing of our holy union and it all turned pear shaped and we flew home weary and bewildered... but that's a whole 'nother post. Sooooo the following year we lived in a hotel at Christmas time, rather nice really, we were in transit from Texas to Georgia and had a month where we were looking for an apartment and our belongings were in storage. We had a few items with us but not too much, his Gorgeousness was starting at a new position within his company and they were handling the relocation. What they failed to tell us was the Christmas Party was the Friday after we arrived, hmmmm, hadn't packed any finery in our limited luggage so we went on a shopping trip and purchased new duds.... oh I miss that kind of shopping spree, just me and him getting decked out in fabulous attire with matching accessories and shoes!!! So off we trot, all gorgeous like, making our way to a fabulous evening of dinner and dancing and getting to know the new crew. These people consisted of a pilots, engineers, officers and their wives.... and us! We didn't know a soul, other than his hideous boss and hideous wife, so it was just a little awkward to say the least. What else was a girl to do but drink the fabulous free wine and have a good time! The rest is history and can't be splashed across the pages of a blog for any old reader to see. Major digression, the point of the story is that when we were out shopping for our couture, we came across these two little Santa's and just had to buy them. I was thrilled but totally bewildered as to why the English Santa is dressed in green and carries a guitar or whatever that is. It seemed so fitting that these guys would be our first Christmas decorations.... so twee!!!!! We still bring them out every year and inevitably have to explain to an American friend that this bares no resemblance to an English Father Christmas and that it was obviously the creation of an over imaginative American. But we love him all the same!!!! Hope you enjoyed this memoir and that you will stop back for another episode in the next couple o' days!!! Oh, I miss that kind of shopping, too! And I have DEFINITELY had my share of those kinds of office parties...and have drunk my share of the free wine as a result! What? We are not supposed to do that kind of shopping anymore? 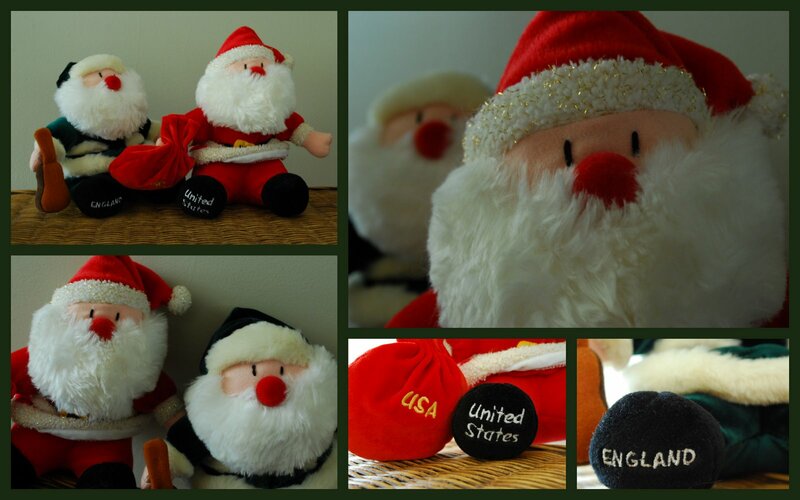 I adore your story of how you got these little Santas! What a great memory.